crispy panko and fresh herbs. Defrost if using frozen. Preheat your oven or toaster oven to 450F. 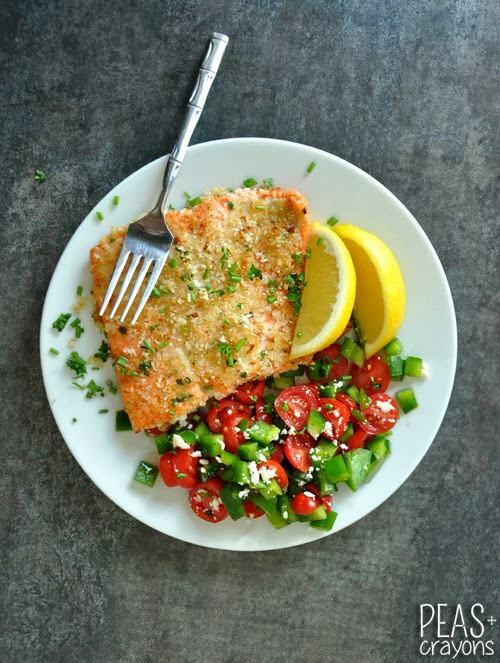 On a plate, combine panko with parsley, chives, garlic powder, paprika, and dill and season with salt, to taste. Using a butter knife, spread an even layer of dijon mustard on each side of the salmon, using extra if needed. Dredge the salmon in the panko mixture, pressing the herbed breading firmly into the fish to coat on both sides. Heat a pan or skillet with a few spoonfuls of olive oil. Once your pan is hot, add the salmon and cook on both sides for approx 2-3 minutes each. Try to be gentle, the panko will start to abandon ship if you manhandle the fish too much in the pan. You can add a little more of the breading/herb mixture while cooking if that happens, no worries! Look for a peachy pink/opaque outer layer on each side with a rare center and a golden panko crust. With a spatula, gently move the salmon to a foil lined baking sheet and bake for approximately 5-10 minutes, depending on the thickness of your fillets, until the center is fully cooked and opaque. If you’re using a cast-iron or oven-safe skillet, pop that bad boy with the fish directly in the oven. The result is a crisp, flavorful crust on the outside with a tender flaky inside. Serve with fresh lemon wedges and garnish with an extra sprinkle of herbs! This entry was posted in Blog and tagged food, healthy, recipe, weight loss. Bookmark the permalink.